Intex is on a launch spree with releasing one after the other smart phones at affordable rates by giving users a taste of Android Kitkat 4.4 in smartphone priced around $100 or Rs. 6000. Intex had earlier launched devices like Intex Aqua Style, Aqua Style Pro both of which sport Android Kitkat. And other devices like Intex Cloud FX which has the Firefox OS. Coming back to Aqua T2 which was launched by Intex will become the cheapest smartphone running on Android Kitkat 4.4 OS, the device runs on a 1.3 GHz MediaTek dual core processor and having a 512 MB RAM out of which only 200 MB space is available for apps storage which is not at all sufficient so intex has provided expandable storage option with the help of a microSD card support upto 32 GB which should be used to store apps to keep the device running smoothly. It also sports a 2MP Rear camera with LED Flash and also a front facing VGA camera which is pretty good as Intex Aqua T2 is just priced at Rs. 2,699. The only drawback which I saw was that Intex Aqua T2 does not support 3G which is the minimum requirement for a device running on Kitkat 4.4 but it supports 2G which is EDGE and GPRS along with Ei-Fi connectivity and its not known whether GPS is supported or not at the moment. 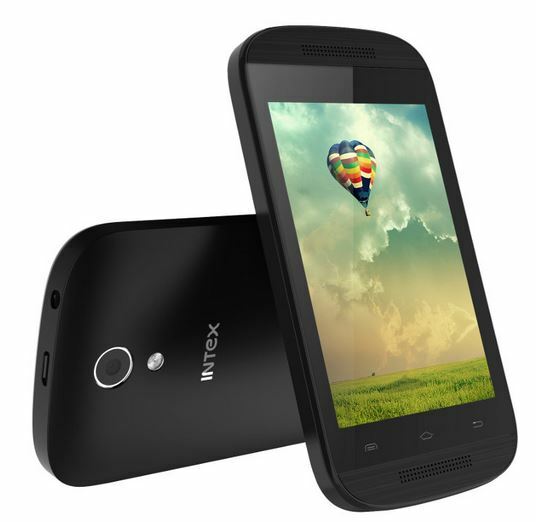 Intex had recently launched the cheapest 4 inch display smartphone called the Intex Aqua 4x which was priced at Rs. 2999 and runs on Android JellyBean. Intex is surely upping the competition with the Aqua Series smartphones covering all categories with the cheapest 4 inch device and the cheapest smartphone running on Android Kitkat 4.4. And with android One devices being priced around Rs. 6,499 to 6,999 intex launching devices running on Android Kitkat at the same price range with similar specifications is not going to make it easy for Abdroid One platform to succeed in India.